Brian McDermott – Harshly sacked or out of his depth? On Monday evening Reading Football Club confirmed that they had parted ways with manager Brian McDermott. The Royals are currently struggling in the top flight, second from bottom only on goal difference having lost to relegation rivals Aston Villa on Saturday, but has McDermott become a victim of his own success? Brian McDermott was given the job on an original caretaker basis in December 2009, after Brendan Rodgers left the club just outside the Championship relegation places. McDermott had previously occupied the post of Head Scout, and his appointment was met with a less-than-rousing reception from the Reading faithful. Masterminding a wonderful run of form post-Christmas, which included an FA Cup win at Anfield, he would adhere himself to the fans, and was given the job full time as the club finished 9th, just seven points off the playoffs. McDermott once again showed his tactical nous in 2010/11, leading the club to the Championship Playoff Final (once again via a second half of the season thrust), only to be beaten 4-2 by a Swansea team managed by his predecessor Rodgers. Last season he saw a change in the club’s ownership, signed a new contract and led the Royals to the top of the Championship, winning the league with two games remaining and ousting the seemingly unmovable bookies’ favourites Southampton and West Ham. Many of Brian’s plaudits agreed that the continued success in the league, as well as two FA Cup Quarterfinals, proved that Reading were right to appoint from within, rather than go for the then available Darren Ferguson. Perhaps it’s a twisted thing of fate then, that McDermott tonight finds himself out of work. When Russian billionaire Anton Zingarevich took majority control of Reading in January 2012, he outlined a plan to see the club progress season by season. When the club clinched the Championship title just 3 months later, it could actually be argued that the progress made had been too immediately. The club didn’t have the infrastructure or squad depth which would have come with a longer period under Zingarevich, and thus were perhaps wholly underprepared for a season in the top-flight. In that case, McDermott is surely deserving of praise for achieving a surprise promotion on the budget and resources he had been given. However, the man last season dubbed as The Messiah had more than his fair share of critics this season. After summer signing Danny Guthrie refused to travel with the squad to Sunderland in December, the midfielder was rightfully disciplined internally, and following an apology, all seemed right and well. McDermott refuted claims there had been a bust-up, and yet Guthrie was frozen from the team for several further weeks. Guthrie, it is agreed amongst Reading fans, is the club’s best ball-carrying midfielder, and McDermott’s stout refusal to use him could be traced as a detrimental factor to the team’s poor performances. It was the fans’ ironic cheering of McDermott’s choice to finally replace the ineffective Leigertwood with Guthrie on 81 minutes at Saturday’s game, which highlighted to the management and board that Brian was beginning to lose his usually solid rapport with those on the terraces. Similar treatment of fan favourite Alex Pearce also cost Brian some backing, as his thinly-veiled reasoning for keeping last season’s Player of the Season on the bench failed to appease the fans. Before the Wigan match, Reading had picked up 1.875 points per game with Pearce in the side. Without him, they had just 0.5 per game. Regardless, after a disappointing 2-1 loss to Stoke, Pearce was singled out as being at fault for the two goals, and was dropped for the largely inexperienced Sean Morrison. In reality, Pearce had performed on par with the rest of his teammates, and both of Stokes goals were well-taken, as opposed to handed on a silver platter by the Royals backline. In their next match, Reading suffered a total capitulation to Wigan, and Morrison had a howler. Of course, there was no mention of the fact that Pearce, seen as a future captain, had delayed further talks on his expiring contract until the end of the season. Although he denied it, fans and pundits alike believe that McDermott was dropping one of Reading’s most effective players on account of his contractual situation, and not due to so-called ‘poor’ performances. Brian was accused of being scared to drop the likes of Jobi McAnuff, whom he made captain at the beginning of the 2011/12 season, and Mikele Leigertwood, but when you look at the ease with which he dropped Guthrie, Pearce and Nicky Shorey, that belief doesn’t add up. His tactics were sometimes baffling, like reverting back to the same 4-4-2 system which saw the Royals slide down the table at the start of the season, and his refusal to add any extra weight of priority to certain games has been criticised as immunising his players to the more important clashes with key relegation rivals. The theory behind taking each game equally makes sense – the players feel no more pressure playing Manchester United than they do QPR – after all, 3 points at Old Trafford are worth no more than those on offer at Loftus Road. The issue is in the reverse. Players become so used to playing with the same attitude and mindset, that when a bit of extra fight is needed or a close rival comes to town in a key relegation scuff, there’s no interpersonal pressure on the group to impel them on. A clear example of that was Wigan’s 3-0 win at the Madejski just a fortnight ago, which had the Royals won, would have lifted them out of the relegation zone. It’s not been all doom and gloom, though. Despite the Royals’ current league position, there’s been plenty to be proud of. Last gasp wins at West Brom and Newcastle, coupled with a draw at Chelsea show the potential is there, and Manager/Player of the Month awards in January for McDermott and Adam Le Fondre respectively keep the fire of hope blazing in the fans’ guts. Brian McDermott should not look back at this dismissal with sadness nor anger. The things he achieved with the resources were unprecedented, and as he cared to remind fans after a few drinks in the Purple Turtle pub following the team’s promotion: “When I was given the job, you all thought ‘Who’s that bald prick?”. 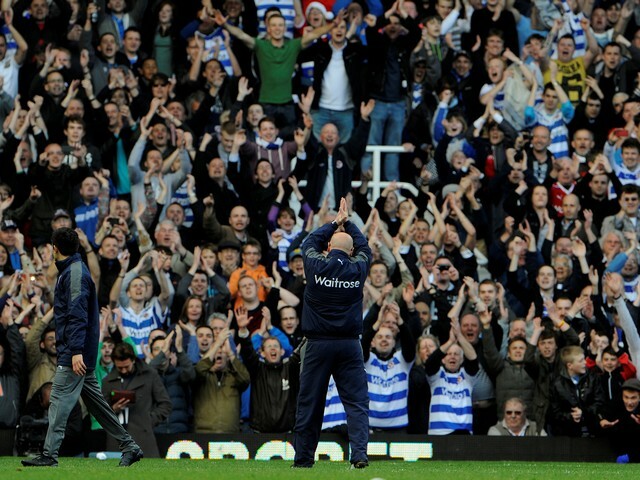 He soon turned around the fans, and took the Royals to the top flight for the just the second time in their history. If the club had stuck with him and relegation was confirmed, he would have been more than qualified to attempt to lead the club back at the first try. In a different world, perhaps he’d have that chance, but Zingarevich has wielded his axe and rested his hopes on the shoulders on McDermott’s successor. Two frontrunners have emerged in Paolo Di Canio and Nigel Adkins. The former was spotted at the Madejski Stadium on the weekend, fuelling speculation that he’s set to get the job having left Swindon last month. Nigel Adkins, however, is seen as the fan’s preference. With two promotions under his belt, his harsh dismissal (much like McDermott’s) was condemned across British football, and his fluid style of football makes him an understandably appealing choice. Ultimately, Eamonn Dolan has been put in charge for the forthcoming game against Manchester United, and time will tell who takes up the challenge on a permanent basis next. As for Brian McDermott, he deserves a holiday, a pint and a huge pat on the back. He won’t be out of work for long, and 12 years of service won’t be forgotten by the Reading faithful any time soon. A victim of his own success, he had true belief in the squad right until the end. Nice one Bri, and as I’m sure you’d say in this situation: We move on. Freelance journalist with a keen sense for all things football. Also partial to tennis and beach volleyball (thanks Lord Coe), but nothing beats the beautiful game. As a Reading fan hidden amongst South Walians, he still has nightmares about Garry Monk’s playoff final block. Dreams of being the English trequartista, but is more Play-Doh than playmaker. Are Feyenoord on course to end their thirteen season wait for a title?